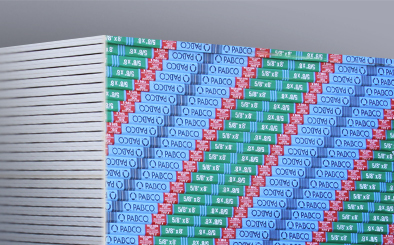 PABCO MOLD CURB® PLUS combines the mold resistant chemistry of MOLD CURB® with the water resistant formulation of WATER CURB® to make dual mold and water resistant panel that provides the most enhanced mold and moisture protection available in a gypsum board product. MOLD CURB® PLUS is comprised of a naturally noncombustible, fire-resistant gypsum core. The core is wrapped in high quality 100% recycled facing and backing paper that is treated with mold and water resistant agents to inhibit the growth of mold and mildew. The facing paper will accept most decorative finishes. MOLD CURB® PLUS Regular 1/2” is used in non fire rated residential or commercial interior walls and ceilings. MOLD CURB® PLUS Type X 5/8” is used in fire-rated interior walls and ceilings in residential or commercial construction.